As the saying goes, "you can't change a zebra's stripes" -- and lucky for them, that's the case. Evolution has been kind to this beautiful animal whose genetic make-up not only gave them their black and white patterns, but also protection from predators. While a zebra's number one nemesis is the lion -- the king of the jungle is color-blind. So all he sees when he views a herd of zebra is a collection of black and white lines moving up and down. But what about smaller critters who could equally be a nuisance to the zebra? Since bloodsucking horseflies are a horse's worst nightmare, you would think they'd also attack zebras. However, according to recent studies by evolutionary ecologists, the zebras' black and white hides may be a turn-off for these insects. The research team at Lund University in Sweden filed their findings last ye ar suggesting that horseflies were not attracted to a zebra's dramatic stripes - and if they had to choose between an all-white horse and an all-black horse, they preferred the darker animal. To verify how unappealing zebra stripes might be, the researchers visited a horsefly-infested horse farm near Budapest. Testing surfaces painted with black and white stripes of varying widths and angles and covered in glue revealed that the narrowest stripes drew the least amount of insects, and that real zebra hides closely matched the patterns that were least attractive to tabanids (the official genus of the horsefly). As of August, 2013, based on this research, scores of horse owners in Germany came up with the novel idea of painting zebra stripes on their horses to see if they could trick those pesky little critters into staying away. The early results pointed to a positive outcome when social networks were flooded with photos of horses sporting the zebra look. So it appears that horseflies are "sight" flies, not "scent" flies. It's not the smell of the horse that attracts them, it's the horse's appearance. 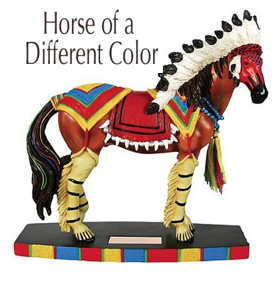 For those horse owners who don't have access to a handy bucket of white or black paint, as an alternate plan, you might think about dressing your horse in multi-color garb. While scientists have not done any research on "clothes-horses," you just might find: horseflies aren't into fashion either! Dear Kitten: The Superbowl Animal Video Of The Day!!! Flemish Giant Rabbit! The Animal Video of the Day!! !